How much does it cost to travel to Tanah Rata? How much money will you need in Tanah Rata? RM523 ($126) is the average daily price for traveling in Tanah Rata. The average price of food for one day is RM169 ($41). The average price of a hotel for a couple is RM510 ($123). Additional pricing is in the table below. These average travel prices have been collected from other travelers to help you plan your own travel budget. How expensive is Tanah Rata? How much money do I need for Tanah Rata? Tanah Rata is one of the main tourist towns in the Cameron Highlands. The Cameron Highlands are in western Malaysia and are a popular retreat for Malaysian residents and international travelers alike. The area's higher elevation offers an often much needed break from the country's oppressive heat. It also has a beautiful setting that is rich in agriculture and has rolling hills that are beautifully covered in tea plantations. Tanah Rata has many of the area's tourist amenities. ATMS, banks, and the area's main hospital are all found in town. For some, the area feels too touristy, but if you linger longer, and explore on your own, you can easily escape the mass tourism and see the area for what it is. Tanah Rata's climate is influenced by it's high elevation of 1,440 meters. The area's climate is much cooler than elsewhere in Malaysia with average highs staying in the low 70s Fahrenheit for most of the year. Average low temperatures are in the high 50s Fahrenheit. Rain is most common during the months of April and May as well as October and November. The sights in the area are very spread out, making it difficult to travel from one place to another without a car or an organized tour. Most of the area's attractions are outside of town in the surrounding areas. Some of the more popular destinations include Mossy Forest, Parit Waterfall, Robinson Rose Garden, Gunung (Mount) Brinchang, Robinson Waterfall, Bharat Tea Plantation and the Butterfly Garden. The tour companies also offer tours into the nearby rainforest, and trips to see the local villages. Tanah Rata is a small town with a variety of travel amenities. Most of the restaurants are found on the main road in the center of town. This is also the location of most of the area's tour companies. The town is flat and easy to walk around, making it a good place to base yourself during your time in the Cameron Highlands. There are some large hostels around town, with the most popular being Fathers Guesthouse. Beds are cheap and the amenities are very comfortable. They have a great community space so it is a good area to meet and chat with fellow travelers who can always offer you some good advice on your future destinations. 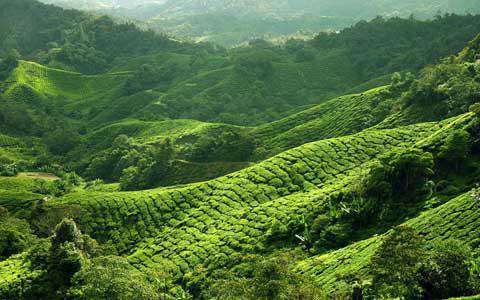 Most people spend their time in Tanah Rata on an organized tour of the Cameron Highlands. Most of the tours and their prices are comparable across companies. Admission fees to exhibits and museums are often not included in the price of the tour, but inquire in advance. Trekking is also one of the most popular activities in the area. There are many trails around, so pick up a map at a tourist information center. The maps each have their own inaccuracies, but the trails are usually well marked. Between Tanah Rata and Brinchang is the Cameron Highlands Golf Course. This is a beautiful 18 hole course, but the maintenance level of the course can vary. There are many restaurants in Tanah Rata that cater specifically to tourists. You'll find the typical options, including Indian, Chinese, and Malay restaurants, but there are also a handful of international restaurants. Interestingly, there's at least one decent German restaurant in town, so if you've had your fill of Asian food, this is an unique option as well. Vegetarian dishes are available at most of the restaurants around town. There is one bar and one pub in Tanah Rata as well. Jungle Bar has a jungle theme and a nightly bon fire. It's a great place to watch football matches on television, and there's also a pool table, dart board, and music. Travelers Bistro & Pub is the only pub in town. It offers a social setting that is a great place to meet other travelers. Tanah Rata is the main tourist town in the Cameron Highlands. This is in part because it serves as the area's main transportion hub. In town there is a taxi station and a bus station where can catch buses to other parts of the region as well as Ipoh and Kuala Lumpur. Even though Tanah Rata is the transportation hub of the area, public transportation remains somewhat limited. It is easiest to explore the area if you have access to your own car. Many budget travelers choose to organize a tour in the area, as this will provide you with the necessary transportation. It also contributes to what many feel is the "mass tourism" of the area. There are many tour operators that can organize day tours for you that include most of the area's highlights. If you have your own car, or a lot of patience, you can explore the area on your own. There are buses, but they are often infrequent and slow, so plan your day accordingly. Tanah rata is a great base for exploring the Cameron Highlands. Their high elevation means the Cameron Highlands are perfect for escaping the Malaysian heat. The major economic driver (aside from tourism) in this area is tea production. You absolutely must visit a tea plantation while you're hear. The tea plantations are quite beautiful. They're built into the hills and the green rolling landscape is incredibly picturesque. You can take a tour of the plantations and see how the tea is harvested and produced. Of course, there's a cafe and restaurant on the grounds where you can sample the tea for a rather hefty price. The tea plantations themselves are quite beautiful though.